The Global Volcanism Program has no activity reports for Atitlán. The Global Volcanism Program has no Weekly Reports available for Atitlán. The Global Volcanism Program has no Bulletin Reports available for Atitlán. Volcán Atitlán is one of several prominent conical stratovolcanoes in the Guatemalan highlands. Along with its twin volcano Tolimán to the north, it forms a dramatic backdrop to Lake Atitlán, one of the scenic highlights of the country. 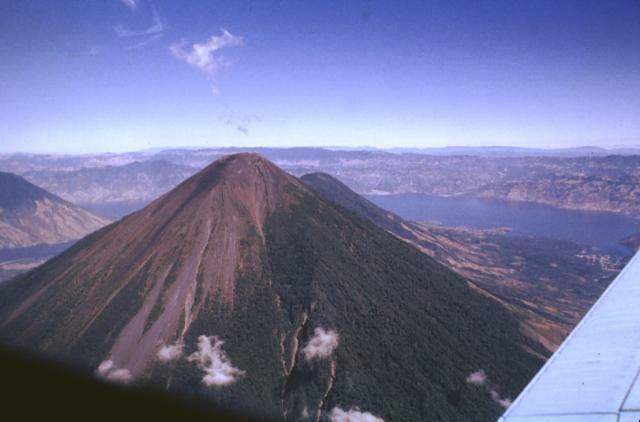 The summit directly overlies the inferred margin of the Pleistocene Atitlán III caldera and is the highest of three large post-caldera stratovolcanoes constructed near the southern caldera rim. 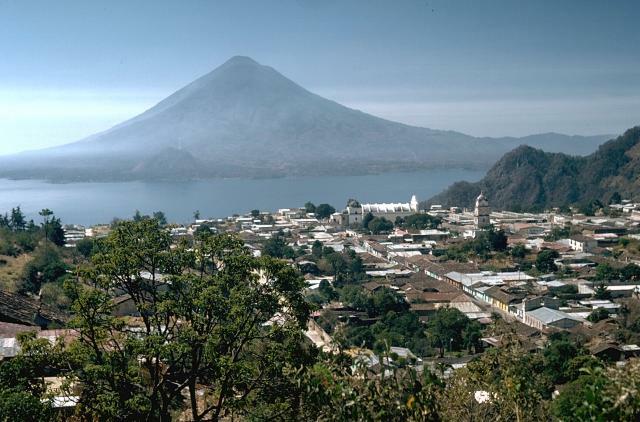 The volcano consequently post-dates the eruption of the voluminous, roughly 85,000-year-old rhyolitic Los Chocoyos tephra associated with formation of the Atitlán III caldera. 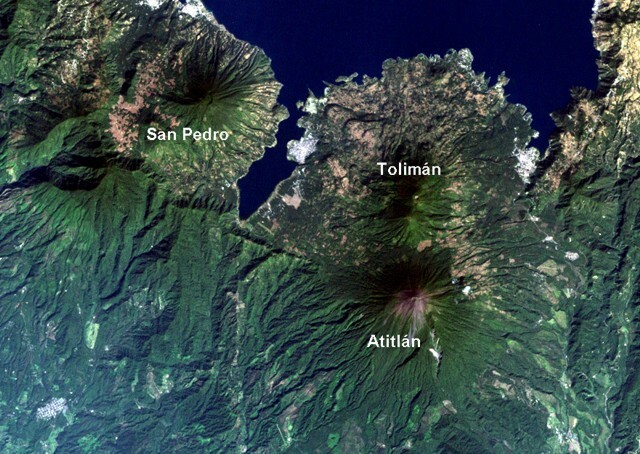 The historically active andesitic Volcán Atitlán is younger than Tolimán, although their earlier activity overlapped. In contrast to Tolimán, Atitlán displays a thick pyroclastic cover. 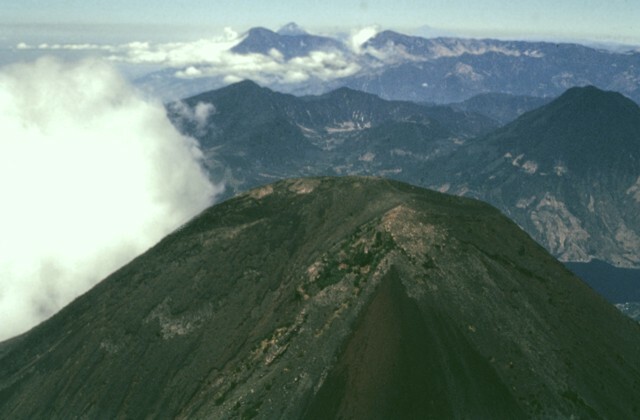 The northern side of the volcano is wooded to near the summit, whereas the upper 1000 m of the southern slopes are unvegetated. 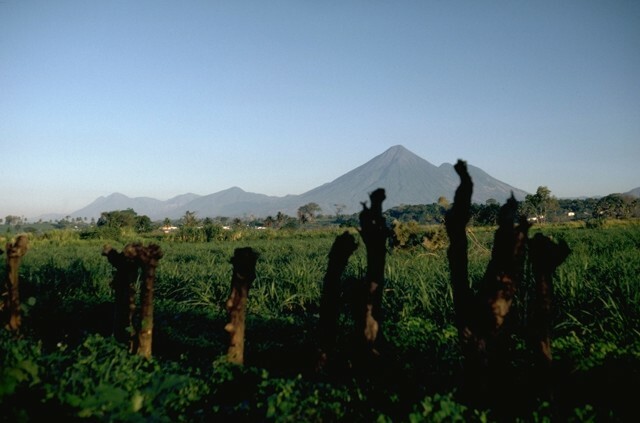 Predominantly explosive eruptions have been recorded from Volcán Atitlán since the 15th century. Haapala J M, Escobar Wolf R, Vallance J W, Rose W I, Griswold J P, Schilling S P, Ewert J W, Mota M, 2006. Volcanic hazards at Atitlan volcano, Guatemala. U S Geol Surv Open-File Rpt, 2005-1403. Rose W I, Conway F M, Pullinger C R, Deino A, MacIntosh W C, Svitil K A, 1999. An improved age framework for late Quaternary silicic eruptions in northern Central America. Bull Volcanol, 61: 106-120. There is no Deformation History data available for Atitlán. There is no Emissions History data available for Atitlán. Conical Volcán Atitlán rises 3500 m above the flat-lying Pacific coastal plain of Guatemala. Atitlán's twin volcano to the north, Tolimán, forms the shoulder to the right of the summit. The volcanic highlands of Guatemala are seen here from the SE with Volcán Santo Tomás (Pecul) on the far left horizon, 35 km to the NW of Atitlán volcano. The resort town of Panajachel (right-center) occupies a delta of the river of the same name that flows into Lake Atitlán. The northern caldera rises up to 1100 m above the lake. 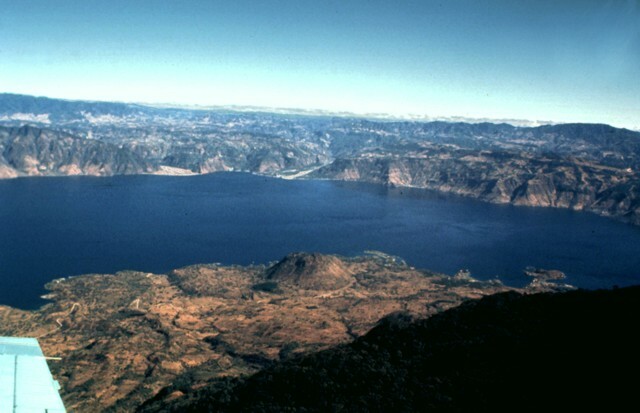 Rapid sedimentation following formation of the caldera about 84,000 years ago has filled in about half of the roughly 600 m depth of the caldera below the lake surface. The level of the lake has fluctuated more than 10 m over periods of several decades, and titles exist to land now submerged hundreds of meters from the current shoreline. High heat flow is present in the lake. Thick units of the 84,000-year-old Los Chocoyos Ash are exposed south of Guatemala City, more than 100 km from its source at Atitlán caldera. Three flow units are visible here. The pinkish layer at the center of the outcrop is the oxidized top of the pyroclastic-flow deposit and is one cooling unit. The bottom two layers are the top and bottom halves of the thick white layer of the pyroclastic-flow deposit. The two fall deposits above the Los Chocoyos Ash are unit E from Amatitlán caldera and the younger unit C from Agua volcano. A panoramic view to the west across Lake Atitlán shows the flanks of Tolimán volcano extending to the lakeshore on the left, San Pedro volcano at the SW end of the lake, and the two sharp-topped peaks of Santo Tomás (left) and Santa María (right) on the center horizon. Tajumulco volcano appears in the distance at the upper right. 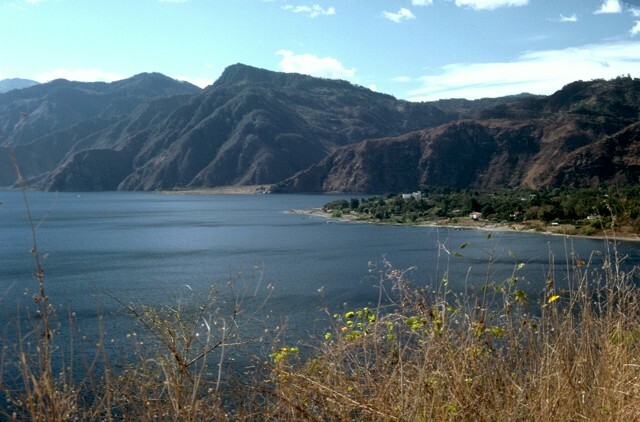 Scenic Lake Atitlán occupies the northern half of the youngest Atitlán caldera, which formed during the eruption of the Los Chocoyos Ash about 84,000 years ago. 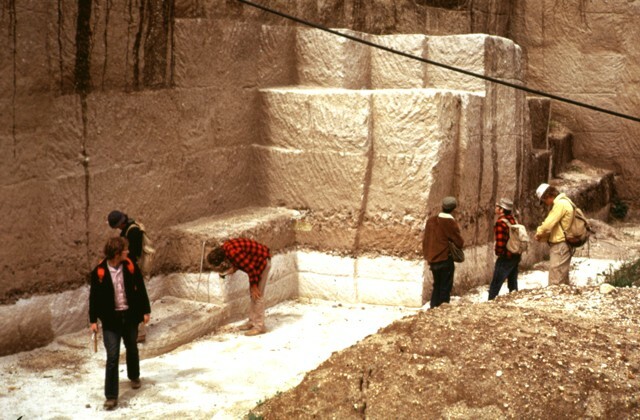 The 84,000-year-old Los Chocoyos Ash from Atitlán caldera is exposed in a quarry near San Juan Ostuncalco, west of Quetzaltenango. The white layer at the base is layer H, a plinian pumice fall unit. 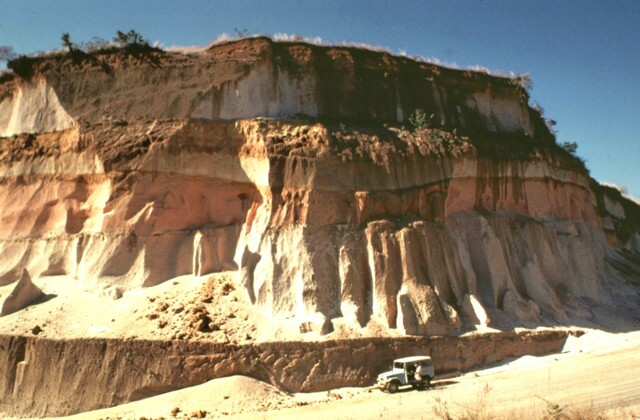 The rhyolitic H pumice fall is the largest currently known plinian fall deposit in Central America. Despite its relative thinness, it is preserved over the entire Guatemalan highlands. The thicker overlying unit is the pyroclastic-flow member of the Los Chocoyos. This massive unwelded pyroclastic-flow deposit is up to 200 m thick. Photo by Bill Rose, 1974 (Michigan Technological University). The unvegetated summit of Atitlán volcano is cut by two shallow craters, the largest of which is breached to the south. San Pedro volcano rises across Santiago bay to the right, and in the distance (left-to-right) are the peaks of Santo Tomás, Santa María, and Tajumulco. 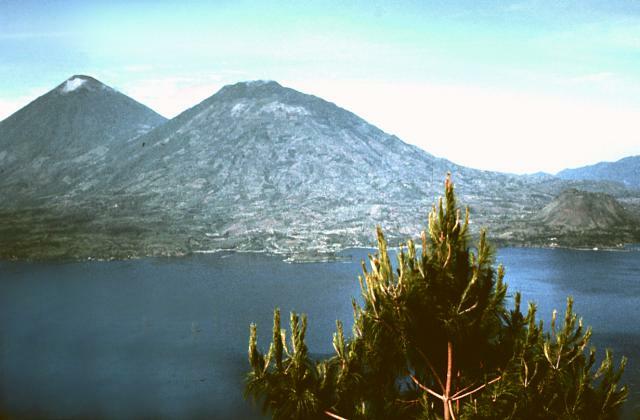 Atitlán is the highest and the only one of the three post-caldera cones of Atitlán caldera to have had eruptions during historical time. 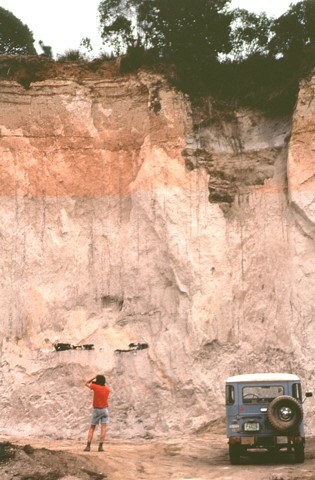 A geologist photographs an outcrop of the 84,000-year-old Los Chocoyos Ash near Patzún, about 10 km east of Lake Atitlán. Note the charred log above the photographer. This pyroclastic-flow member of the Los Chocoyos is up to 200 m thick and is exposed over an area of about 2000 sq km. Individual flow units of the voluminous 275 cu km ignimbrite are sometimes more than 100 m thick. The upper part of the deposit is characteristically salmon-pink in color as a result of oxidation of the cooling flow. 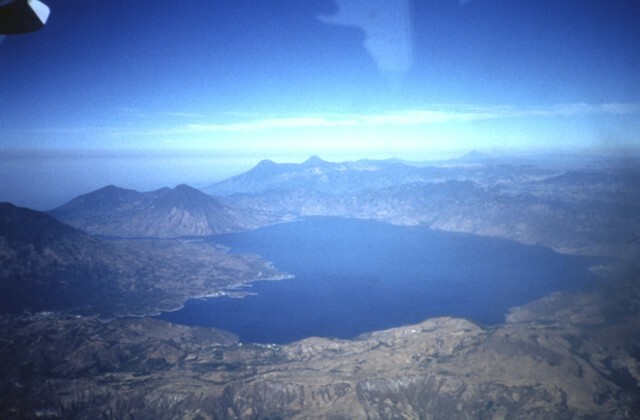 Lake Atitlán, one of the scenic highpoints of the Guatemalan Highlands, fills the northern part of the Atitlán caldera complex. 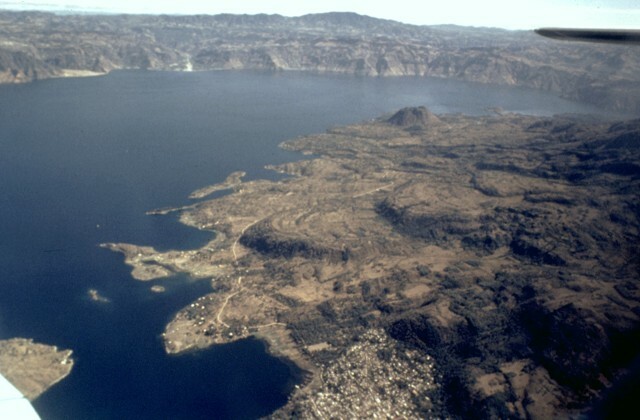 The caldera formed in three stages; Atitlán I caldera about 11 million years ago (Ma), Atitlán II caldera about 8 Ma, and Atitlán III caldera about 84,000 years ago. 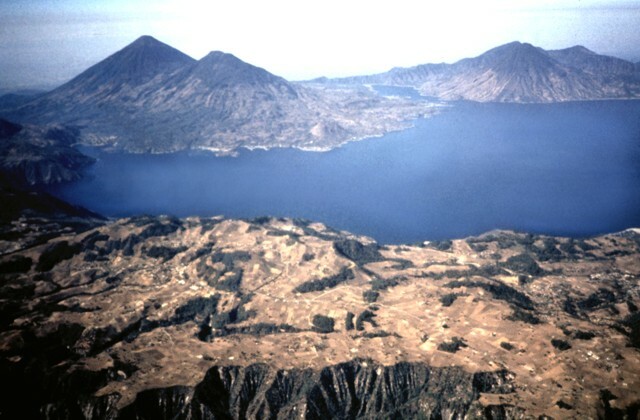 The southern margin of the first caldera lies near the southern shore of the 18-km-wide lake; San Pedro and Tolimán volcanoes were constructed over the southern margin of the second caldera and Atitlán volcano over the third. There are no samples for Atitlán in the Smithsonian's NMNH Department of Mineral Sciences Rock and Ore collection. Large Eruptions of Atitlán Information about large Quaternary eruptions (VEI >= 4) is cataloged in the Large Magnitude Explosive Volcanic Eruptions (LaMEVE) database of the Volcano Global Risk Identification and Analysis Project (VOGRIPA).